Ok so you know those wedding rules that say things like that your wedding should have one theme color so that everything matches? Well...those rules don't apply to you. Yeah, that's right. Committing to one man does not mean you have to commit to one color. You can have as many colors as you want. This bride chose four, and we featured all of them on her wedding cake. Not only that, but she wanted hearts, and dots, and flourishes. And we said, hey. Its not every day you get married (hopefully). Why not have it all? When you come into our family-owned bakery in Rancho Cucamonga you get to have it all. All the flavors you want, all the colors you want, all the decorations you want. One or five. Unique and creative, or traditional. Simple, or elaborate. We'll do it! 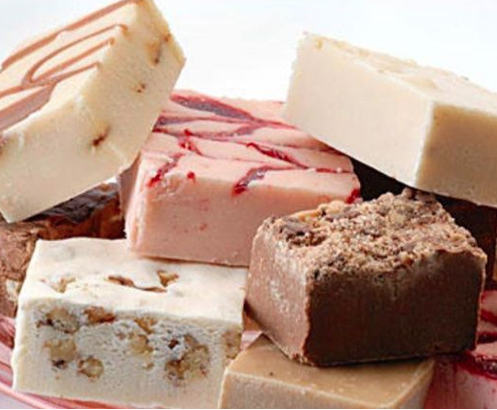 We have eleven cake flavors and more than 30 cake fillings to choose from. And yes, you get to have more than one, if you want. Are you looking for inspiration for your Southern California beach wedding? 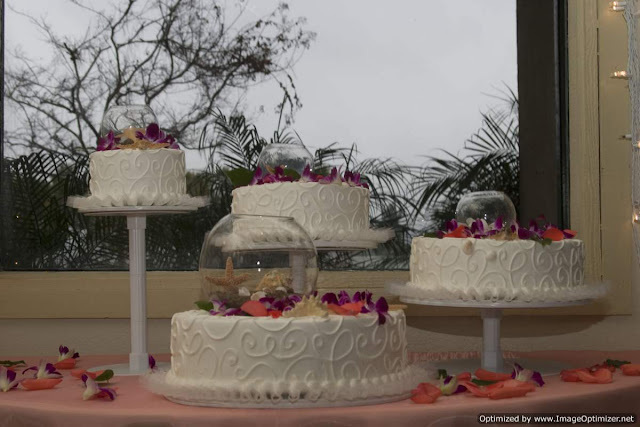 We did the above cakes for a Rancho Cucamonga area couple's wedding on the beach. We garnished them with a simple adornment of fresh orchids and rose petals. The round candle holders, filled with beach treasures, are reminiscent of glass buoys found in the sand. Like a beach wedding, these cakes have a fresh, summery, simple beauty. Check out our website or our Pinterest to find more inspirational wedding cake pictures. Other beach-inspired wedding cakes include piped or sculpted sand dollar or shell adornment, sandcastle shaped cake, or a beachy bride and groom cake topper like this one. Aside from the traditional white wedding cake which is great for a beach wedding, a pale blue cake with white accents is a popular choice for a beach-themed wedding. No one says you have to stick with tradition though! You can make a splash with a cake decorated with surfboards, lobsters, oysters, whatever floats your boat. Recently we blogged about ten kinds of traditional wedding cakes, but did we forget to mention...no reason you have to choose only one! 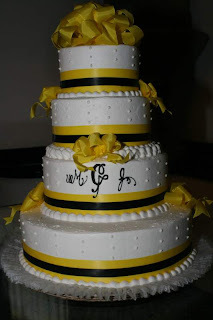 This wedding cake we did incorporated several traditional wedding cake elements: the swiss dot pattern, monogram, and ribbon accents in the wedding colors. If you are planning a wedding, take a look at our website or our Pinterest for inspirational wedding cake pictures. When you come into our bakery, you can meet with one of our cake stylists and share your inspirations. We can make a cake that incorporates one or more of these elements with your own personal flair. In addition to beautiful traditional cakes, we also design cakes in unique personalized styles that stand out from the crowd. Your wedding day is your day and should reflect your taste! No matter what your taste is, we promise it will be delicious. Check out this custom edible bride and groom cake topper we made for a wedding. Do you like the idea of a fun edible fruit sculpture for your wedding cake? Or perhaps you have another event planned where your cake needs a little fruity personality? Great for bachelorette, anniversary, or baby shower...we can come up with a design that will be cute and delicious. 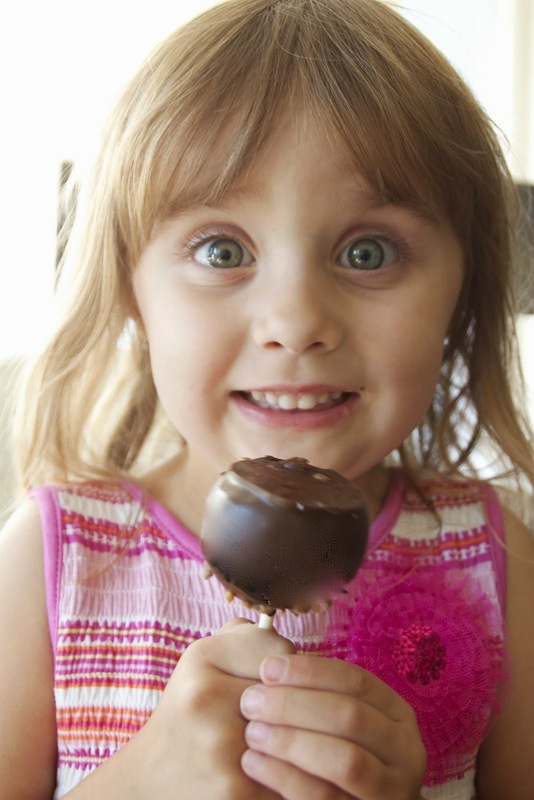 If chocolate-dipped fruit is not your thing, keep browsing. 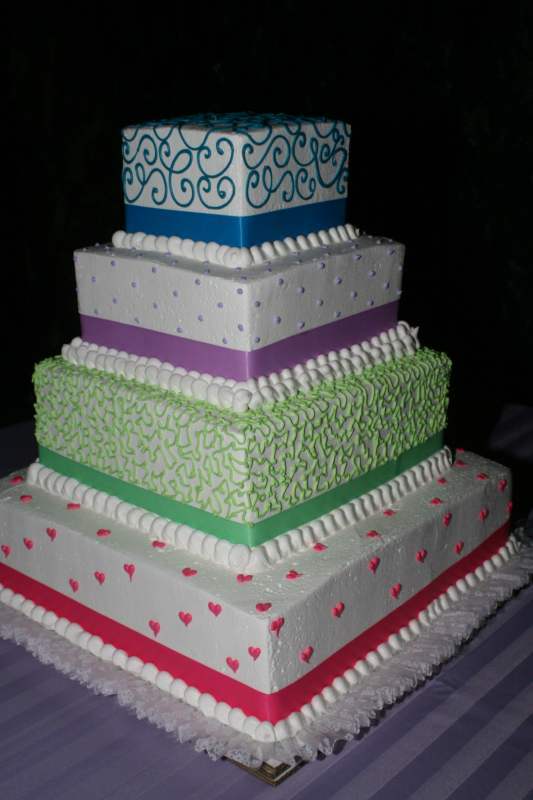 We have many flavors of cakes, filings, and decor- traditional and unique. Browse our designs on our Pinterest for inspiration and pin us to your most-wanted-cakes board. Or make a date to come in to our bakery in Rancho Cucamonga and see and taste our cakes and meet with a designer. We have the right cake for you. This wedding reception was a black tie affair. 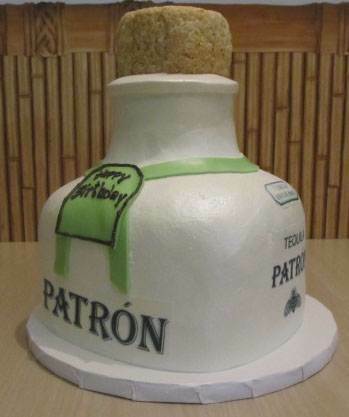 They sent the message, with this cake from our bakery Rancho Cucomonga, dressed to impress. Of course, tradition dictates that the cake should resemble the bride's attire, but why not break with tradition and have a cake dressed like the groomsmen? Surely black bowties and buttons are as appropriate as layers of white buttercream, and a fun new interpretation of tradition. This kind of cake would be lovely with a surprise formal dark chocolate interior! Check out all our cakes on our Pinterest, and pin them to your wedding planning boards. Or, even better, come on into our shop and taste our offerings as well! Our cake stylists can help you design the wedding cake of your dreams. Let's be honest. 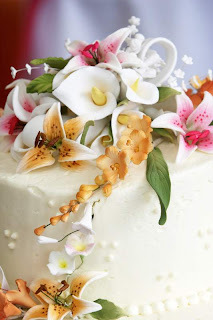 Aren't flowers just that much more beautiful when you can eat them along with the rest of your cake? We offer a variety of sweet, scrumptious varieties of handmade flowers atop our cakes. Check them (and other styles) out in our gallery. You can also find us on Pinterest, a great place to organize your wedding planning inspirations. 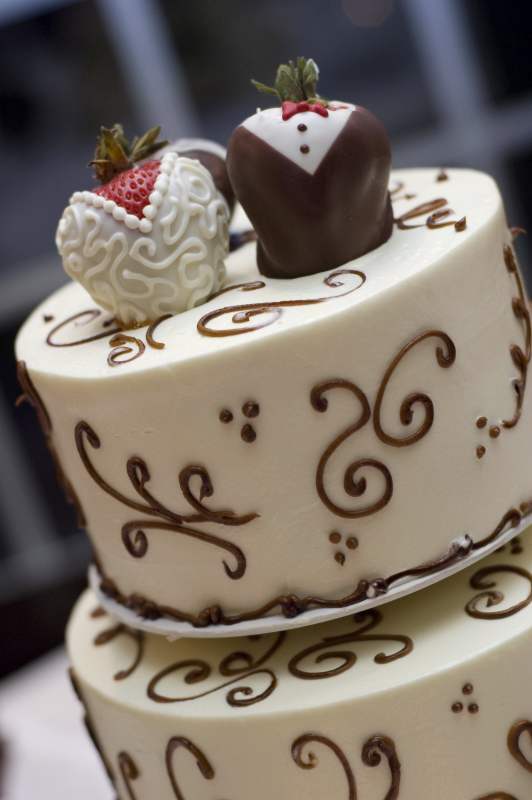 After you've browsed, make a date with our cake stylist to sit down, sketch out your ideas, and sample some flavors and fillings of our heavenly wedding cakes. 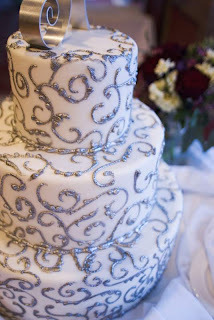 Look at this silver scroll work wedding cake we did at our bakery Ontario! We think it came out pretty beautiful. This cake was a gorgeous centerpiece for a wedding that featured silver, but we think something similar would also make a cake to celebrate a 25th anniversary. 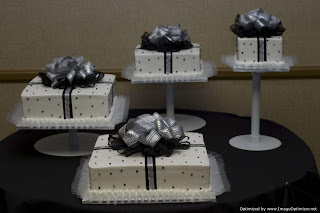 If someone you love is celebrating their silver wedding anniversary soon, ask them if you can help them out with a stunning cake for their big party. 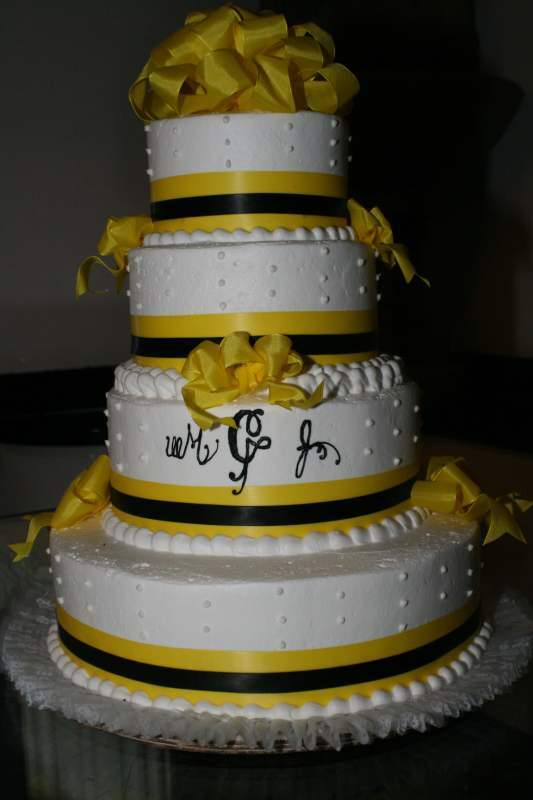 Check out our website's wedding cake pictures gallery to see all our offerings of custom flavors and fillings, and diverse designs, from simple and understated, to flamboyant and fun. Once you have an idea of what you like, set up a date to come in and taste, and work on your design with one of our custom cake stylists. Also, find us on Pinterest! Looking for unique wedding cake pictures? 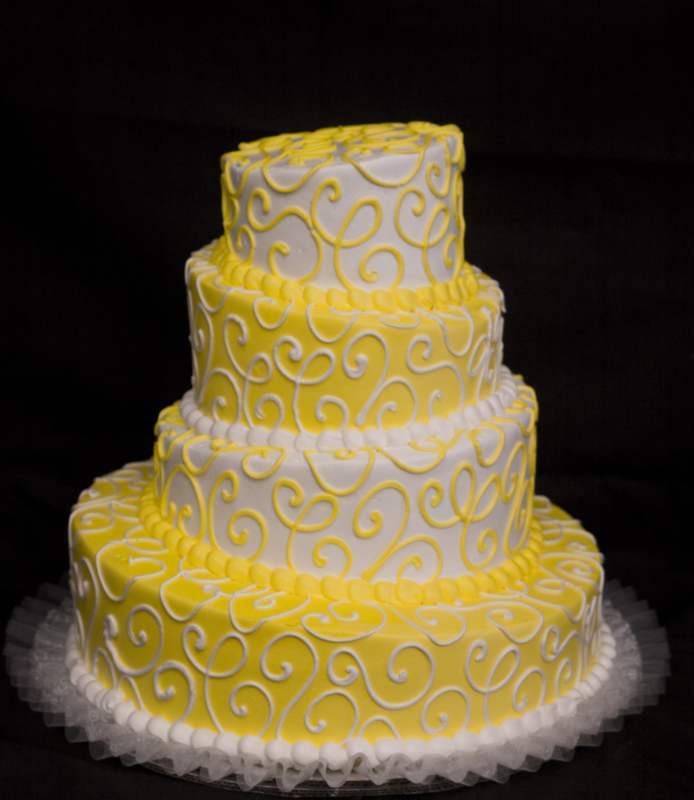 Check out this playful wedding cake we did in yellow and white scrollwork. 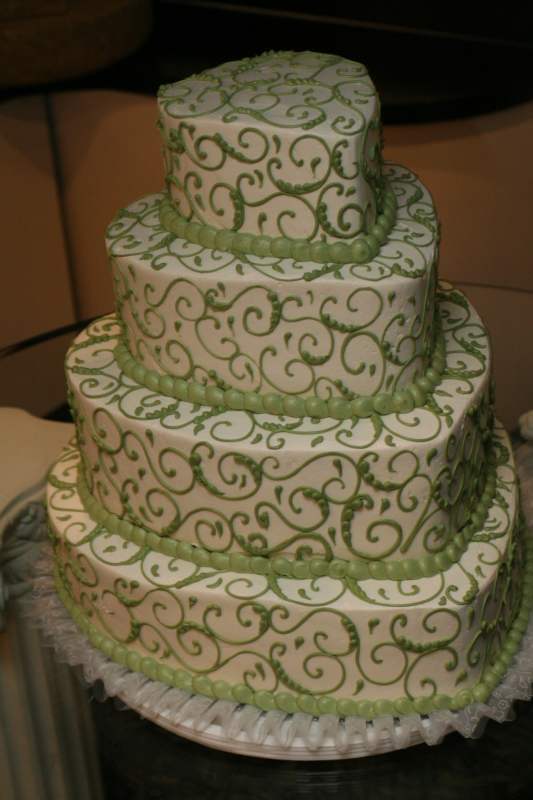 Do you like the topsy-turvy design of this cake? If this is a design you'd be interested in for your wedding (or birthday, or anniversary, or bachelorette party, or...), let one of our cake stylists know. We will make your cake custom to your preferences, but this is one example of a recent unique wedding cake we did. We have many others in different styles as well. Choose from more than 30 flavors of fillings! Don't forget to find us on Pinterest and create a board to pin and keep track of your favorite cake designs. Are you looking for a special way to appreciate your dad this Father's Day? If the same old thing just won't do for your old man, consider surprising him with a unique cake from our bakery Rancho Cucamonga. What dad doesn't love cake? At Ontario Bakery we specialize in unique special occasion cakes that pack personality. Is your dad a traditional dad? Instead of another necktie, how about a necktie cake? Is your dad a fisherman? How about a cake shaped like a fish (but flavored with something better)? Is your dad a Lakers fan? How about a purple and gold fan cake? Whether your dad is a biker, a musician, or an artist, we can make a cake that will make him happy this Father's Day, June 17th, 2012. 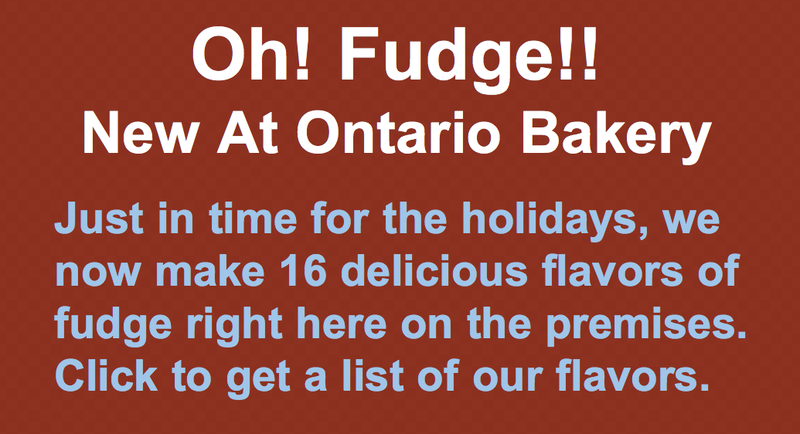 Check out our 32 cake filling flavors, and 10 cake flavors. Does your dad love carrot cake? Would he love an Italian Rum cake? Show your love for your dad with the perfect cake from our family-owned bakery. We bet he will share some with you.